How do you get your protein? People always ask me that question. It’s never how do you get enough Vitamin C? Or how do you get enough riboflavin? It’s always how do you get enough protein? The truth is, I struggle a bit with getting enough protein. It’s easier if you use dairy products, but neither my husband nor I tolerate dairy very well, especially now, more than three years since our switch away from a meat-based diet. The experience has been like peeling away the layers of an onion. The further away from meat we got, and the better we felt, the more we started noticing little things like the fact that my chronic ear infections were a result of being allergic to cow’s milk. Once dairy was out of my diet—no more ear infections. Phil did try to keep eating cheese, but more and more he could not tolerate it, either. Then we learned about how ultra-pasteurization alters the shape of milk protein. I have found I can tolerate raw milk just fine. It’s the pasteurized stuff that makes my lungs burn and—if I use it daily, as in my precious cup of morning coffee—the congestion it creates in my head and sinuses eventually brings on an ear infection. Since we’ve eschewed dairy altogether, I no longer have asthma symptoms or ear infections, and Phil has not had a single sinus infection, which he was prone to. About the only physical symptom I was still struggling with was fatigue. I’ve dealt with it my entire life—fatigue and what is termed “chronic mild dysthymia,” meaning that always just a tiny part of me felt sad. Oddly, I didn’t have these symptoms when I was younger and dieting, which, in the old days amounted to days and weeks of nothing but vegetables and lean meat and totally avoiding starches. Last year, at a funeral for a close friend, I was sitting with one of her sisters when a young girl came running up with a chocolate cupcake. That cupcake had a twirl of frosting and a maraschino cherry on top. “Can I have this, Mom?” the six-year-old, bouncy towhead asked. “Only the frosting,” her mother said, and held the cupcake in such a way that the girl could capture the dollop of frosting in one clamping of the lips. I am extremely sensitive about things spiritual. I believe nothing happens by accident and that all of life, if we let it, converges to make good things happen for us. Those sentences put a chill through me that I would swear was my friend Rachel’s spirit passing through me. I unfisted the homemade roll I had just bitten into and left it on my plate. It took me nearly a year more of clawing my way around up-and-down energy and periods of fatigue. Denial and the urge to self-destruct can be a rock-solid mountains sometimes. Give up beer? Give up cookies? Give up toast? Finally, in June of this year, an experiment. A week away from home working. No beer. No toast. No cookies. Nothing with gluten. Of course, it probably goes without saying I had energy like, well, like a six-year-old. When someone drops a hammer on my head, I do notice. Blue Moon Vegetarian includes several similar testimonies. The first weeks without meat were astonishing in terms of the changes in our energy levels, but we eventually did begin to struggle with getting enough protein. You just can’t eat beans every night. Discovering hemp protein gave us another boost (see below). But I work from home most of the time, so no one knows what my days are like, and I have never confessed it, not even to Phil, but I used to have days when I could not get off the couch until noon or after. And despite how much I tried to have a positive attitude, I still could not shake that low-lying sadness. I tried everything there is to try to fight it, even serotonin-reuptake inhibitors. All they did is make me want to clean the house. Then there it was, in all that sadness at the loss of my friend Rachel, a gift from beyond. My body, it turns out, is intolerant of gluten. I have few regrets in my life, but occasionally late at night, I have wondered how things might be different if only it hadn’t taken fifty-five years to figure it out. “There was a time when some researchers insisted that the only way to get a complete protein—a protein containing all the essential amino acids—was to eat a complete protein in the form of fish, eggs, or animal flesh. Others said you could combine incomplete proteins, such as those in grains and legumes, the combined amino acids in each coming together in the gut. 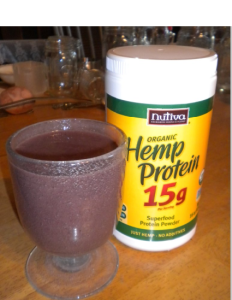 Now we understand that as long as all nine amino acids are consumed at some point throughout the day, the body can do what it needs to, and we also know that hemp seed—yes, that lowly little commoner that is cousin to marijuana (and no, you can’t get high from consuming it)—contains a complete protein, and pretty much is the only plant source that does. “Gamma-linolenic acid (GLA) is an EFA in the omega-6 family and is found naturally in only a few food sources: hemp seed, black currant oil, borage oil, and evening primrose oil. The average North American diet tends to have too much omega-6 fatty acids compared to omega-3 fatty acids, because the body also converts GLA from LA, which is plentiful in cooking oil and processed foods. For optimum health, the ratio of omega-6 to omega-3 fatty acids should be between 1:1 and 4:1. The typical North American diet is usually in the range of 11:1 to 30:1. This imbalance contributes to the development of long-term diseases such as heart disease, cancer, asthma, arthritis, and depression as well as increased risk of infection. Hemp seed oil is 55% LA and 25% LNA, or a ratio of 2.2:1; however, not all omega-6 fatty acids have the same effect on the body. Linoleic acid (not to be confused with alpha-linolenic acid, which is in the omega-3 family) and arachidonic acid (AA) promote inflammation, thereby also increasing the risk of disease, especially when consumed in excess. We have been drinking protein shakes for years now. The ingredients can be as variable as the sun. I, especially, love adding a handful of kale and a tablespoon of molasses. Because of Phil’s diabetes, we now skip the orange juice in favor of the actual fruit. These days we use coconut milk kefir and yogurt and almond milk instead of the cow’s milk versions, but here is the original basic recipe as it appears in Blue Moon Vegetarian. In a blender, chop bananas or other fruit. Add hemp powder, plain yogurt, fruited kefir, orange or other juice, and sparkling water. Adjust the ingredients to suit individual taste. Makes approximately two 16-ounce servings.